One in ten iOS devices have been updated to run iOS 12 in the first 48 hours after its public release. The release of a new version of iOS, typically leads to a flood of users acquiring it as an update for their existing iPhone or iPad or following the company’s annual September event, through buying a new iPhone. According to data collected by analytics, the early result of the release are following a well worn path for installations. 2.8 percent of all iOS devices measured by the firm had iOS 12 installed on September 17, the day of its release. 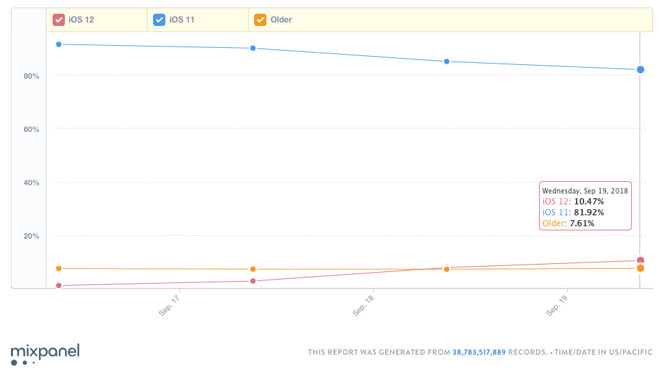 Approximately 24 hours after release, iOS 12 installation hit 7.83 percent, followed by 10.38 percent the next day. For iOS 11, the data indicates it was on 1.58 percent of devices on september 18,2017, the day before its release, then the total rose to 4.14 percent on the day of release 11.29 percent the next day and 15.91 percent two days after launch. On face value, this suggests iOS 12 is shifting at a slower rate when compared to the previous releases. According to most recent results published on Sept 3, iOS 11 made up a 85 percent of all iOS compatible devices.